India levelled the three-match ODI series riding on Rohit Sharma’s mesmerizing unbeaten knock of 208, which helped India post a mammoth target of 393 in Mohali. Sri Lanka, in reply, could only muster a paltry total of 251 after the Indian bowlers kept claiming wickets at regular intervals. 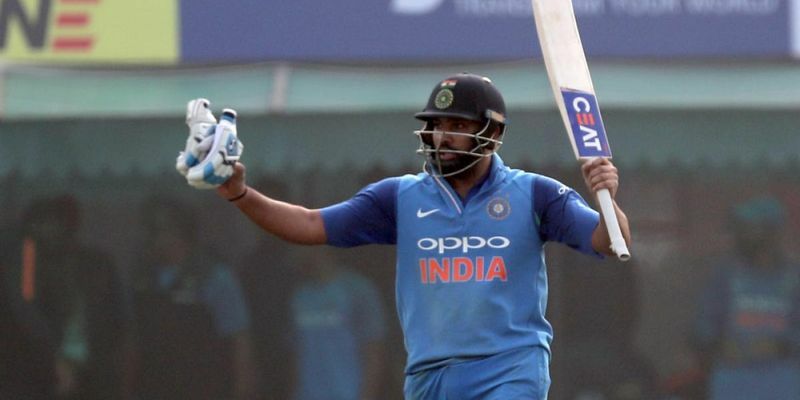 Brief scores : India 392/4 (Rohit Sharma 208*, Shreyas Iyer 88; Thisara Perera 3/80, Sachith Pathirana 1/63) beats Sri Lanka 251/8 ( Angelo Mathews 111, Asela Gunaratne 34; Y Chahal 3/60, J Bumrah 2/43) by 142 runs. India decided to hand all-rounder Washington Sundar his debut in place of Kuldeep Yadav as the hosts came into the second ODI with a lengthy batting order. Sri Lanka, on the other hand, named an unchanged side for the game as they eyed to seal the series in Mohali. After a horrendous start in the last game in Dharamsala, Rohit Sharma and Shikhar Dhawan ensured that India didn’t stand on shaky grounds right from the start again. The dampened Mohali wicket didn’t have lateral movement that the Indian batsman had succumbed to in the last game which meant that the Sri Lankan bowlers were no longer as dangerous and Dhawan made sure that the crowd had knowledge of it when he sent last game’s tormentor, Suranga Lakmal, for a beautiful boundary through extra cover and mid-off on the very first ball. After a slow and safe start, that saw India reaching 33/0 in the first 10 overs, the duo put their foot on the pedal. Dhawan played the aggressor’s role clinching his 23rd ODI fifty while Rohit showed an uncharacteristically subdued self to take India past the 100-run mark in the 20th over. Sri Lanka got their lucky break in the 21st over, when an adventurous Dhawan mistimed Sachith Pathirana’s delivery and was caught by Lahiru Thirimanne at short mid-wicket. Shreyas Iyer, who joined Rohit at the crease, steadied the ship and guided India to 133/1 at the halfway point of the innings. After failing to take his chance in the last game, Iyer knew that the batting-friendly strip was a glorious chance to make himself a regular in the side and his stroke plays reflected his confidence. With Rohit Sharma already settled at the other end with a well-made fifty, the skipper decided to take over Dhawan’s role. Though both of them mainly dealt in singles, occasional boundaries in almost every over left a hint of things to come in the later stages. Perera’s plan of mixing pace and spin remained ineffective as India got to the 200-run mark in the 35th over. Iyer’s aggressive play saw him reach his maiden ODI fifty in 50 balls with Rohit reaching his 16th ODI ton 10 balls later. It was raining fours and sixes now as India looked at a mammoth score as their scoreline read 245/2 in the 40th over. Rohit, who had already found his groove by then, helped India put up 300 on the board in just 44 overs. Iyer looked unstoppable too, sending the Lankan bowlers to the stands for fun before his inexperience prevented his maiden ODI hundred as he gave away his wicket to de Silva on Perera’s delivery. With India more than comfortable at 328/2, MS Dhoni came to the crease muchy to the excitement of the Mohali crowd. However, it was the Rohit Sharma show as the Indian opener brought up his third double century to help India post a humongous score of 392/4. With a humongous target for Sri Lanka to chase, the Indian bowlers were hardly under pressure. And, it wasn’t the strike bowlers who drew the first blood but Hardik Pandya, who sent Upul Tharanga packing in the fourth over itself, reducing Sri Lanka to 16/1. It was a tame dismissal that saw the opener mis-hitting Pandya’s cutter into Dinesh Karthik’s hands at cover. Thiramanne, who came in after the dismissal, tried to steady things in the middle but Bumrah made sure Sri Lanka never got into any sort of rhythm sending Gunathilaka packing for just 16 off 19 balls. With Sri Lanka looking dead and buried, in came Angelo Mathews, who along with Thirmanne, tried to consolidate the innings. However, Thirmanne’s attempt to hit a reverse paddled sweep ended with Sundar claiming his first ever ODI wicket as the ball crashed into the stumps. With Sri Lanka struggling at 67/3 after 16 overs, they got a much-needed breather from the flurry of dismissals as Niroshan Dickwella held the crease alongside Mathews to bring up Sri Lanka’s 100-run stand in the 20th over. However, it didn’t last for long as Yuzvendra Chahal got Dickwella caught at the short third and by the 25th over, Sri Lanka saw almost half of their batting-order back in the pavillion with the scoreboard reading 124/4. With Mathews happy to just rotate the strike, it was Gunaratne who took the responsibility of upping the run-rate as the visitors needed more than 11 rpo to get to the target. He took a special liking to Sundar, hitting him for four boundaries in two overs that led to the debutante being taken out of the attack. Just as Sri Lanka might have thought of launching a comeback, Dhoni, through a stumping and a diving catch, got rid of Gunaratne and Perera in a single Chahal over to leave the visitors reeling at 166/6. By the time Bhuvneshwar sent Pathirana packing, the result of the game was no longer in question. However, Mathews kept rotating the strike and finally took his team’s score past Rohit’s tally in the 42nd over with a boundary through mid off. In what looked like a recreation of a batsman batting with a tailender in a Test match, the former Sri Lankan skipper brought up his century. However, Mathews couldn’t bring any sort of respectability to the score as Sri Lanka played out the entire 50 overs but could only manage to put up a score of 251/8, losing the game by 111 runs. The decider to this see-saw series will now be played in Vizag on Sunday.